Feed yourself - or feed a hundred close friends. 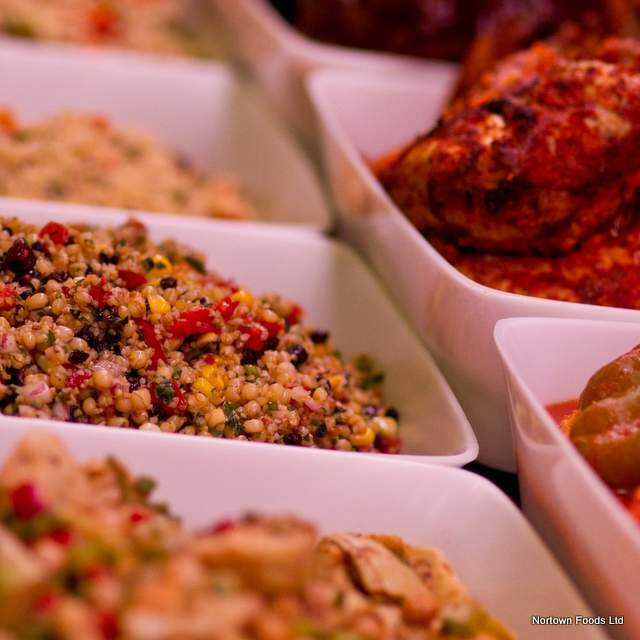 Nortown Foods prepares everything in-house, offering a fresh selection of prepared foods daily. Our deli section is packed with time tested favourites including our signature tuna salad, potato salad and cole slaws. We have a fresh selection of appetizers, side dishes and salads including low fat choices, and extensive vegetarian selections and grain salads. Pick up a ready made meal, lunches for school and work or a snack on the go with our fresh prepared burgers, kid tested chicken fingers and more. Our deli meat selection, always freshly sliced for you, combines traditional deli meats and trusted names with the latest in healthy lean, nitrate free and low salt deli meats and alternatives. Our packaged Nortown products bring the best of the deli counter home to you. Try our sought after seven-layer dip, cheese blintzes and potato latkes along with a selection of appetizers and spreads. We offer a range of home made soups including favourites like beef barley, chicken matzah ball or butternut squash, Our soups taste just like your family’s, but with more selection. Think of Nortown for any of your party tray needs for any event or celebration, and for any amount of people. Like we say: Feed yourself, or feed a hundred of your closest friends. Select here to see what Nortown has cooked for you.